This well-written skimo guide contains everything you need to know to get started racing. Even veterans of the sport will pick up some helpful tips. 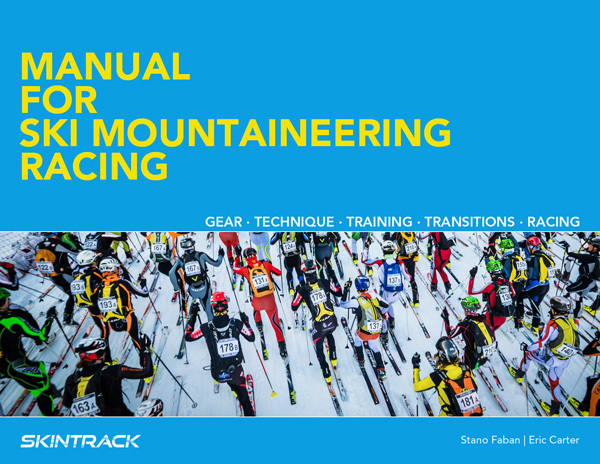 Written by Skintrack.com’s Stano Faban and Eric Carter who combined have many years of experience racing in World Cup and other ISMF races. Click here to order the eBook directly from the authors. This manual is a must-read for anyone first getting into skimo racing. All those little tips & tricks that so many of us acquired through trial & error (especially error! ), it’s pretty much all in here. Plus the links to specific start times in Youtube videos pick up where text descriptions and still photographs have their inherent limitations. My only quibble would be that some of the gear advice that I helped work on is now available in the form of Skimo Co’s comparison charts and articles. But then again, that just means that the manual and Skimo Co complement each other nicely.